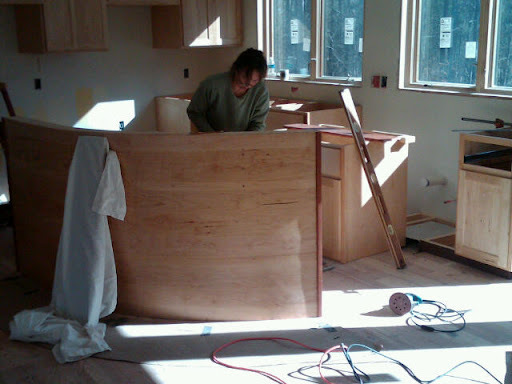 The custom kitchen cabinets went in this week. Installing these too were tricky, owing to the curved south wall. But they are solidly built and look terrific. Diane is an artist and has been doing this for many years. 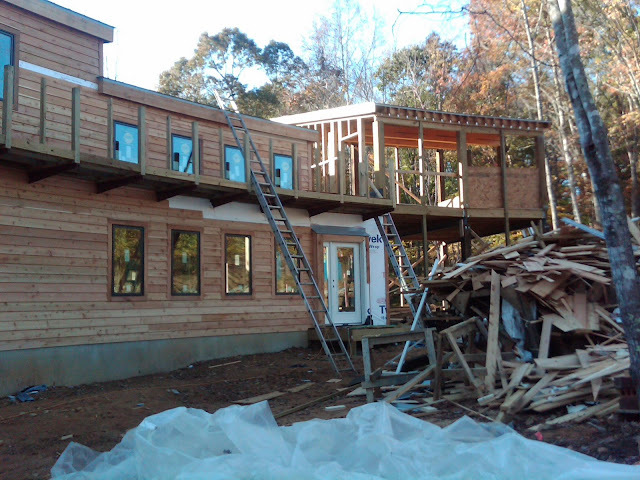 I’m giving two and a half weeks to get the interior trim and stairs in. We’re simultaneously installing the ceramic tile and most of itshould be in at the end of this week. We’re also templating for the granite countertops. The weather has been very cold but the kerosene heater inside allows us to continue staying warm and on schedule. We’ve started interior trim this week after installing the heartpine floor over Christmas week. The heartpine layout is tricky: there are “rays” coming off the north wall and extending across the great room to the more expansive south wall. They’re layed out approximately every 5’ where we’ve installed steel columns that support the elevated walkway on the north side. Then we infilled perpendicularly between the rays. The floor guys installed in half the time I expected. Two days vs. four!! 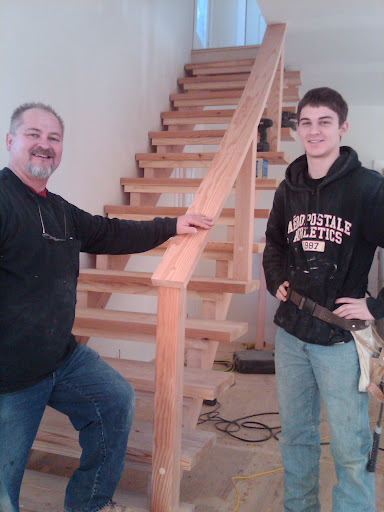 The carpenter we have doing the interior trim is taking care of the stairs, too. 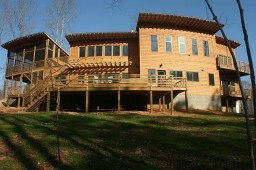 The handrailing mirrors the curve of the exterior wall. Lots of progress on the interior this week! We are now about to spray foam insulate the roof and walls. 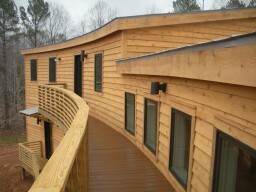 The beveled cedar siding looks great. All the corner boards and trim are 5/4” cedar. Installing on the curved walls took more effort to get the measurements down but went well. The 5-V crimp metal roof (find more here) also took more effort, particularly at the rakes since it all flares out since the south wall is much longer than the north wall and it shows up on the roof accordingly. 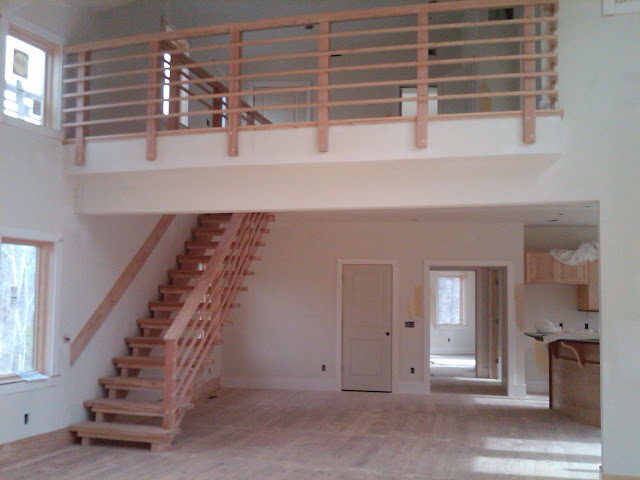 Installing the pine decking on the first floor and the Trex on the second floor took more effort as well, not to mention the deck railings. The mechanical, plumbing, and electrical rough-ins, however, didn’t have to put in more effort than usual, unlike what I expect in laying the tile and hardwood flooring as well as installing the interior trim. Next week we hope to start hanging drywall and we’ll be moving into the finishing stages. The owners are pleased and challenged to get us their finish selections in a timely way. There’s a lot of running around to suppliers on top of living a busy work life! 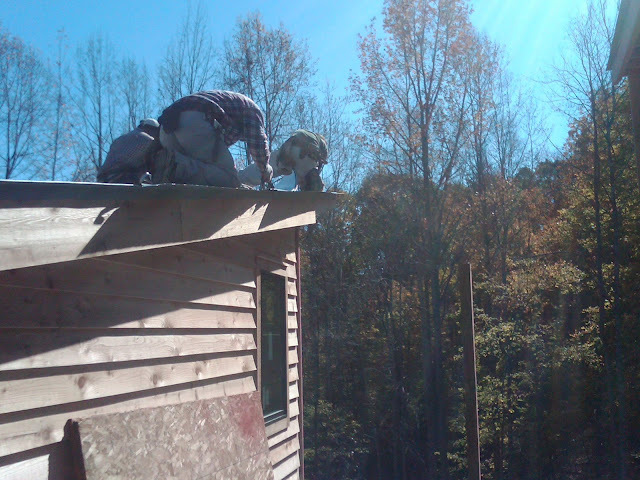 But I think that by seeing the house being built, with quality and good subs, is invigorating despite the stressors.